As mentioned a few posts ago I'm starting to get army fatigue painting the pointy-eared gits, and with NOVA approaching I figured I'd better shift gears and get back to the Thousand Sons. Last week Forge World put the newest updated "red book" up for pre-order, which contains all the collated and updated rules for the generic legion army lists gathered from the first five Horus Heresy books and associated FAQs (the previous red book only covered the first three books). While I absolutely adore the big leatherbound tomes and all the gorgeous art and fun fluff found within, for gaming purposes it's really hard to go wrong with the slim and trim red books. That book as well as several others are now winging their way to my doorstep, at which point I'll be able to tweak the NOVA army lists a bit based on the various point changes (of which there are many and varied, so the NOVA list is going to be heavily revamped). 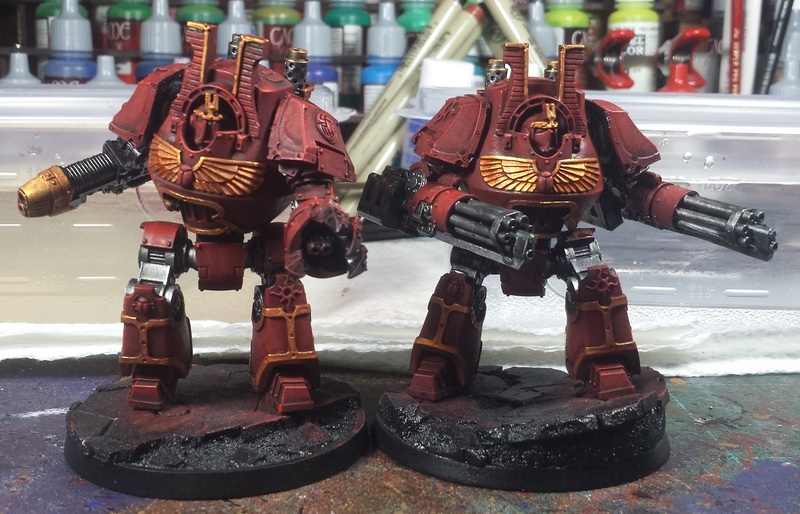 All that said, I do plan on taking both of the Contemptors, so best get cracking! The next step after the reds are the metallics, with the underpinning body structures and weapons given the boltgun metal/badab black/boltgun metal treatment (they'll benefit from a further silver highlight, judging by these pics) and the gold/reikland fleshshade/gold on the various trim pieces (again, looking to need a further highlight pass). Next up is a blue laid in on everything intended to be white, as well as weapons and eyes which will of course continue to be blue. The white parts got a hit of Ghost Grey, while the blue gets a guilliman blue wash. Both the white and the blue will get further highlights, but as it was 85F in the loft at this point I had to flee for cooler climes and attach the next steps this coming weekend, when I can get some dedicated brush time in during the cool of the morning! Still quite a lot of work yet to do but it definitely feels good to be getting back the the Sons! Looking really good buddy! 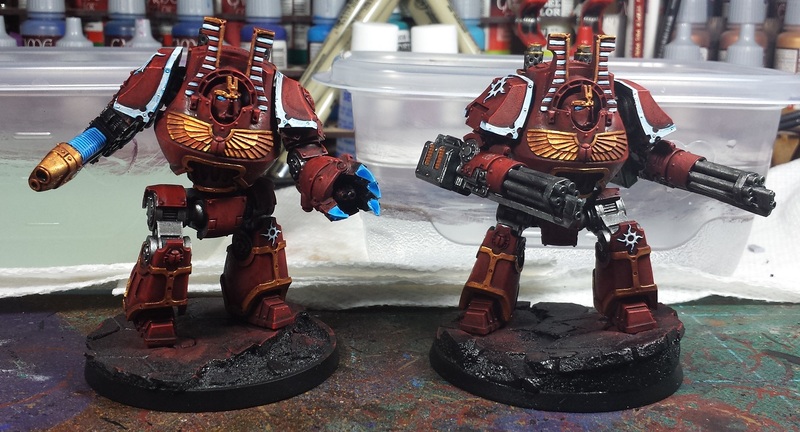 I've always like the Thousands sons models you've worked on, the red is spot on. Looking good man, they are really starting to come together as you layer on the details. Bravo. Maybe Ksons were always colour blind ? Who knows ? @Colonel Winterborne: Thanks very much, man! @Rory Priest: Haha! I'm interested to see if FW does up some rules for the post-rubric Thousand Sons! @Greg Hess: Hah! Cheers man!